Because Alaska is disconnected from the continental United States, sometimes we have to get creative with our travel needs. 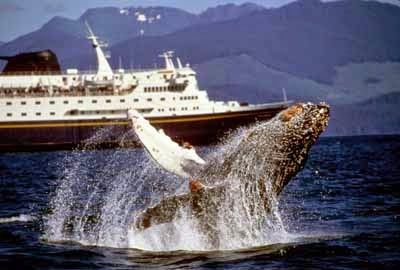 Obviously, most people fly to and from Alaska, but the Alaska Marine Highway is great alternative. And amazingly beautiful! The ferry system is in place to carrying passengers, vehicles, and goods to and from 33 Alaskan communities, Canada, and Washington state. There are currently 11 ferries in operation. Don't I sound like a smarty-pants? I cheated. Of course. Hooray for Google. And wouldn't you know it, her name was Sarah. I'm not kidding. I vividly remember crying so hard I could hardly breathe. It was the cruelest of circumstances. With our great big motorhome on board in the belly of the ship, we made the gradual trip north. Though it was a slow way to go, it was still jolting. But not as bad as jumping on a plane and being in a new state and climate in just 3.5 hours. We exited the ferry in Haines, Alaska, located just north of Seattle, and drove the rest of the way to our new home. It was a LONG trip through Canada, icy mountain roads, and then back into Alaska. This road is known as the ALCAN, Alaska-Canadian Highway, or the Alaska Highway. This journey was not without excitement and a little danger, but it was also a really fun thing to do as a family. Back to the Marine Highway. So fun. Sightseeing. Whales. Wildlife. Wow. For the most amazing sights and more information, click the links above!! This is day 17 in a 31 day series called hello, Alaska. Find all posts in this series in one place HERE.